Jessica Churchill-Bissett, from the MMO's marine planning team, led a volunteer clean-up of beaches in Devon on behalf of the Torbay Cleaner Coasts Initiative. She discusses her experience. I work in the marine planning team at the MMO and am based in the MMO’s office in Brixham, Devon. The South Marine Plan, which the Government recently adopted, was produced by my team on behalf of Defra. The plan provides a policy framework which will be used to help inform decision-making on where and how the marine environment is developed, protected and improved in the next 20 years. As part of this it supports activities that reduce marine litter and encourages public bodies to remove litter from beaches. My interest in caring for our beaches extends beyond my job. 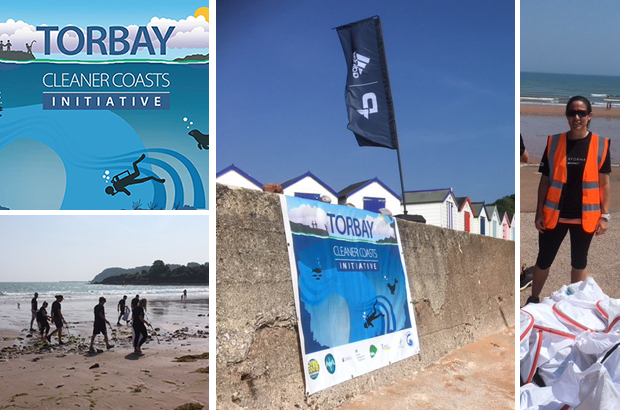 I also volunteer for the Torbay Cleaner Coasts Initiative (TCCI), which is a partnership aiming to clean up and protect coastal habitats in Torbay, Devon. 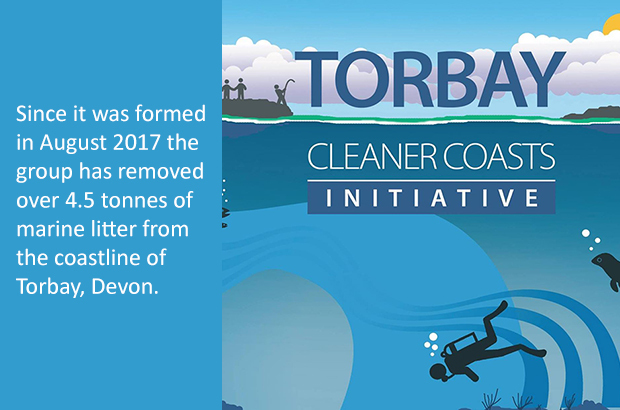 Since its formation in August 2017 they have removed over 4.5 tonnes of marine litter from the Torbay coastline. This has been achieved by an amazing response from the community offering to volunteer their time and muscle for the cause. Working for the Government I’m fortunately able to take up a paid volunteering opportunity. I gave a day of my time to lead a beach and coastal clean-up on behalf of TCCI for 30 corporate volunteers, including from South Devon College, Pro:Direct, an online sports retailer based locally, and Adidas. My role included giving a safety briefing, providing the kit and surveying the litter. It was a gorgeous day with the heat wave in full swing, so after applying sun cream we all set off with litter sacks and pickers. The beach of Broadsands where we started was not too bad for marine litter as it is cleaned regularly throughout the summer season. We found more litter on the rocks in between Broadsands and Elberry beach with evidence of people enjoying picnics and other recreational activities on the secluded rocky outcrops. Elberry beach had more litter as many items of plastic remained from the severe easterly’s that hit the bay in the spring. The litter here included a large barrel from the local mussel farm (used for buoyancy), string and rope from commercial fishing vessels and bottles and plastic pieces washed up from the marine environment (some of which had obviously had been there a while). After carrying all the marine litter back to Broadsands we sorted the litter for recycling. We ended up with three bags of rubbish for landfill and three for recycling. It was a thoroughly enjoyable and rewarding day, full of team spirit and enthusiasm for making a difference to our local area. Well done Jess. Not only am I in awe of how you juggle your life as a wife, mother and Marine Planner but to put so much time love and effort into out local coast lines is amazing. I love being able to volunteer to help out at beach cleans so thank you for helping to facilitate locally.